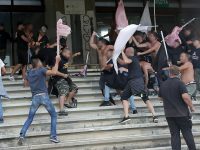 A group of Ajax fans were attacked by Dynamo Kyiv hooligans as they relaxed at a Kyiv pub before a Champions League play-off tie on Tuesday. 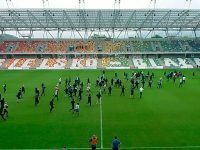 A brawl broke out between rival fans before a Polish lower-division match on Sunday. 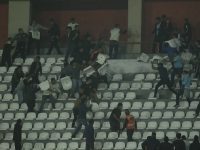 Palermo fans fought among themselves in the stands during Saturday's Serie B match against Salernitana. Biel-Bienne fans were attacked by Young Boys hooligans at a bar before their Swiss Cup match on Saturday. Sporting Cristal and Universitario supporters clashed inside Lima's Estadio Nacional prior to kick-off in their Primera Division match on Sunday. 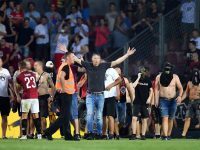 Sparta Prague's Europa League second qualifying round tie against Spartak Subotica was briefly halted on Thursday after a group of Sparta hooligans broke onto the pitch.